This consolidated table of contents to Printing History O.S. contains authors (or reviewers) and titles. 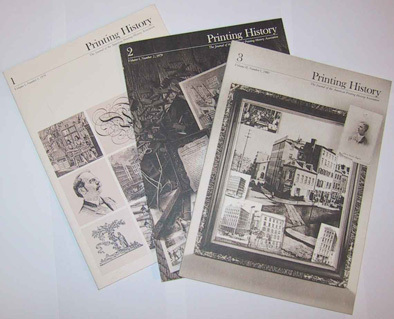 (The consolidated table of contents for Printing History New Series is here.) References are made to whole issue number and pages. Combined issues are indicated by a dash; for example, combined issue 7/8 is noted as “7–8.” See APHA’s list of back issues for sale and issue numbering of Printing History. Some out-of-print issues can be found at many research libraries. Susan Thompson, Early Journals of Interest to APHA, Excerpts from five earlier printing related journals: The Typographic Messenger, The Inland Printer, The American Bookmaker, The Engraver and Printer, and The Printing Art. Rollo G. Silver, The Autobiography of Stephen P. Ruggles, [Partial transcription of an 1870 autobiography by inventor Ruggles (1808–1880).] Joseph R. Dunlap, Two Victorian Voices Advocating Good Book Design: I. Henry Stevens and the Shoddimites. Gordon B. Neavill, The Modern Library Series: Format and Design, 1917–1977. Peter M. Van Wingen (reviewer), Nicolette Gray, Nineteenth Century Ornamented Typefaces. Joe W. Kraus (reviewer), Joseph Blumenthal, The Printed Book in America. John Bidwell (reviewer), J. Ben Lieberman, Type and Typefaces. Madeleine B. Stern, Isaac M. Singer’s Type Machine. Rollo G. Silver, Violent Assaults on American Printing Shops, 1788–1860. E. Richard McKinstry, A Sketch of the Brief Printing Career of David Cree, 1784–1786. Octave Uzanne, The End of Books [reprinted from Scribner’s (1896)]. Stephen O. Saxe, The Type Founders of New York City, 1840–1900. Joseph R. Dunlap, Two Victorian Voices Advocating Good Book Design: II. Charles Kegan Paul, Perceptive Publisher. Neville Thompson, A Note on Bruce Rogers in Youth and Age. Robert Singerman, A Curious Document Attributing a Jewish Background to Johann Gutenberg. William J. Dane, A Bradley Reminiscence. James Wells (reviewer), Scott Bruntjen and Melissa L. Young, Douglas McMurtrie: Bibliographer and Historian of Printing. Robert D. Harlan (reviewer), John Tebel, A History of Book Publishing in the United States, Volume III. Madeleine B. Stern (reviewer), Leona M. Hudak, Early American Women Printers and Publishers, 1639–1820. Anna Lou Ashby (reviewer), Sir Francis Meynell and Herbert Simon,Fleuron Anthology. Joseph Blumenthal (reviewer), John Ryder, The Case for Legibility. Alexander Nesbitt, A Life with Type and Letters. Madeleine B. Stern, Every Man His Own Printer: The Typographical Experiments of Josiah Warren. John Bidwell, Some Caslon Ornaments in Some American Books. Jonathan A. Hill (reviewer), David McKitterick, ed., Stanley Morison & D.B. Updike: Selected Correspondence. Daniel Traister, The Renaissance Book, Introduction to conference papers. Elizabeth E. Eisenstein, The Early Printer as “Renaissance Man”. Natalie Zemon Davis, Misprint and Minerva: Printers’ Journeymen in Sixteenth Century Lyon. G. Thomas Tanselle, Analytical Bibliography and Renaissance Printing History. Ruth Mortimer, The Dimensions of the Renaissance Title Page. William S. Peterson, William Morris and the “Damned Chemists”: The Search for an Ideal Ink at the Kelmscott Press. Stephen O. Saxe, A Brief History of Golding & Co.
Bernard McTigue, English Bookbinding and the Continental Woodblock Tradition. Theodore Low DeVinne, How He Collected his Bill. Elizabeth Harris (reviewer), The History of Printing from its Beginnings to 1930: The Subject Catalog of the American Type Founders Library in the Columbia University Libraries. Introduction by Kenneth A. Lohf. William S. Pretzer (reviewer), Comp. and ed. by John Gibson and Laurie Lewis, Sticks and Stones: Some Aspects of Canadian Printing History. Paul Standard (reviewer), A.S. Osley, Scribes and Sources: A Handbook for the Chancery Hand of the Sixteenth Century. Robert Rainwater (reviewer), Basil Hunnisett, Steel-engraved Book Illustration in England. Philip A. Metzger (reviewer), The Business of Enlightenment: A Publishing History of the Encyclopedie, 1775–1800. J. Rigbie Turner (reviewer), Richard J. Wolfe, Early American Music Engraving and Printing: A History of Music Publishing in America from 1787 to 1825. James Green (reviewer), Marguerite V. Doggett, Long Island Printing 1791–1830. Roderick Cave, The Lost Years of the Golden Cockerel Press. Rollo G. Silver, The Convivial Printer: Dining, Wining, and Marching, 1825–1860. Alice D. Schreyer, The Permanence of Ephemera, [Introduction]. Katharine F. Pantzer, Ephemera in the STC Revision: A Housekeeper’s View. Georgia B. Bumgardner, Vignettes of the Past: American Historical Broadsides Through the War of 1812. John Buechler, “Adapted from an Old Book”: Some Sources for Chiswick Press Woodcut Initials. Robert D. Harlan, The Memoirs of William M. Cubery. Felix B. de Marez Oyens (reviewer), Peter Amelung, Der Frühdruck im deutschen Südwesten 1473–1500: eine Ausstellung der Württembergischen Landesbibliothek Stuttgart. Band 1: Ulm. Francis O. Mattson (reviewer), Giovanni Mardersteig, The Officina Bodoni: An Account of the Work of a Hand Press, 1923–1977. 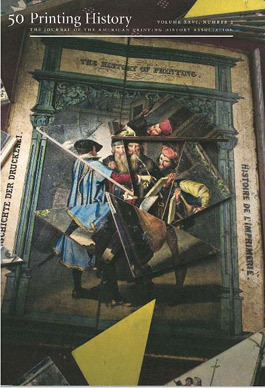 Daniel Traister (reviewer), Elizabeth L. Eisenstein, The Printing Press as an Agent of Change: Communications and Cultural Transformation in Early-Modern Europe. Rollo G. Silver (reviewer), Robert B. Winans, A Descriptive Checklist of Book Catalogues Separately Printed in America, 1693–1800. John Bidwell (reviewer), Madeleine B. Stern, ed., Publishers for Mass Entertainment in Nineteenth Century America. John Kaser (reviewer), Bernard Bailyn and John B. Hench, eds., The Press & the American Revolution. Robert Rainwater (reviewer), Basil Hunnisett, A Dictionary of British Steel Engravers. G. Thomas Tanselle (reviewer), Geoffrey Ashall Glaister, Glaister’s Glossary of the Book: Terms Used in Papermaking, Printing, Bookbinding and Publishing with Notes on Illuminated Manuscripts and Private Presses. John Lancaster, Nineteenth Century America: Book Trade Technology and Social History. [Introduction]. Rollo G. Silver, The Power of the Press: Hand, Horse, Water, and Steam. James J. Barnes, Jonas Winchester: Speculator, Medicine Man. Stephen O. Saxe, Vincent Fitzpatrick, and Frederick N. Rasmussen, H. L. Mencken: in the Steps of Gutenberg. Neville Thompson, Bruce Rogers Looks Back. Elbert Hubbard to W. W. Denslow from The Sanford & Helen Berger Collection. Tobin A. Sparling (reviewer), Gordon N. Ray, The Art of the French Illustrated Book, 1700–1914. 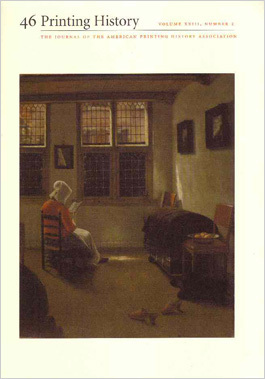 Marie Elena Korey (reviewer), Margaret Spufford, Small Books and Pleasant Histories: Popular Fiction and Its Readership in Seventeenth-Century England. Thomas L. Bonn, The First Pocket Book. Michael Winship, Printing with Plates in the Nineteenth Century United States. Philip J. Weimerskirch, Ed., W. R. Chambers & Co., The Externals of Books [reprint]. Sue Allen (reviewer), Joseph Blumenthal, Typographic Years: A Printer’s Journey Through A Half Century, 1925–1975. David Farmer (reviewer), John Dreyfus, A History of the Nonesuch Press. Larry E. Sullivan (reviewer), Henry R. Wagner & Charles L. Camp, The Plains & the Rockies, A Critical Bibliography of Exploration, Adventure and Travel in The American West, 1800–1865. Michel Thériault (reviewer), Elizabeth Hulse, A Dictionary of Toronto Printers, Publishers, Booksellers and Allied Trades, 1798–1900. Blanche T. Ebeling-Koning (reviewer), Robert Darnton, The Literary Underground of the Old Regime. Mark Farrell (reviewer), Nati Krivatsy, Bibliography of the Works of Gregorio Leti. 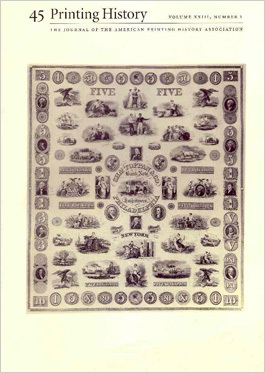 Judy L. Larson, Separately Published Engravings in the Early Republic: An Introduction to Copperplate Engraving and Printing in America Through 1820. Larry E. Sullivan, Old and New Directions: Doctoral Research on New York Printing History. Marcella Genz, editor, BR to Robert Ballou. [Bruce Rogers letter]. John Bidwell (reviewer), Fred Schreiber, The Estiennes: an annotated catalogue of 300 highlights of their various presses. Roderick Cave (reviewer), William Morris, The Ideal Book. Essays and Lectures on the Arts of the Book. Paul S. Koda (reviewer), Matt T. Roberts and Don Etherington,Bookbinding and the Conservation of Books: A Dictionary of Descriptive Terminology. Bernard McTigue (reviewer), Susan E. Meyer, A Treasury of the Great Children’s Book Illustrators. William S. Pretzer, Tramp Printers: Craft Culture, Trade Unions, and Technology. Peter M. VanWingen (reviewer), Christian Axel-Nilsson. Type Studies: The Norstedt Collection of Matrices in the Typefoundry of the Royal Printing Office; a History and Catalogue. Daniel Traister (reviewer), Miriam Usher Chrisman. Lay Culture, Learned Culture: Books and Social Change in Strasbourg, 148o-1599 and Bibliography of Strasbourg Imprints, 1480–1599. Stephen Paul Davis (reviewer), M. Crump and M. Harris, eds. Searching the Eighteenth Century: Papers Presented at the Symposium on the Eighteenth Century Short Title Catalogue in July 1982. Larry E. Sullivan (reviewer), Alan Dyer. A Biography of James Parker, Colonial Printer. Richard Newman (reviewer), Donald Franklin Joyce. Gatekeepers of Black Culture: Black-Owned Book Publishing in the United States, 1817–1981. James Trissel (reviewer), Roderick Cave. The Private Press. GraceAnne Andreassi DeCandido (reviewer), Tiller: A Bimonthly Devoted to the Arts and Crafts Movement. Alexander Nesbitt (reviewer), Marc Drogin. Anathema: Medieval Scribes and the History of Book Curses. Larry Silver (reviewer), Sandra Hindman, ed. The Early Illustrated Book: Essays in Honor of Lessing J. Rosenwald. Paul Hayden Duensing (reviewer), William Caslon. A Specimen of Printing Types. Introduction and notes by James Mosley. John Dreyfus, A Transatlantic Involvement with Printing History. Roderick Cave and Kathleen Coleridge, For Gospel and Wool Trade: Early Printing in New Zealand. 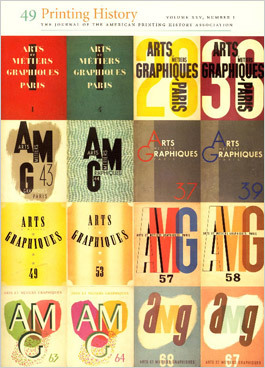 C. Deirdre Phelps, The First Publication to Use American-Made Type. William S. Peterson (reviewer), John Carter and Graham Pollard, An Enquiry into the Nature of Certain Nineteenth Century Pamphlets,2d ed. ; Nicolas Barker and John Collins, A Sequel to an Enquiry into the Nature of Certain Nineteenth Century Pamphlets by John Carter and Graham Pollard: The Forgeries of H. Buxton Forman and T. J. Wise Re-examined. David Pankow (reviewer), John Buechler, Charles Whittingham, Printer, 1795–1876; James Davis, Printed by Hague and Gill; Vincent Torre, A Tribute to W. A. Dwiggins on the Hundredth Anniversary of His Birth; Gay Walker, The Works of Carl P. Rollins. Robin Heyeck (reviewer), Phoebe Jane Easton, Marbling. Bernard McTigue (reviewer), Brigid Peppin and Lucy Micklethwait, Book Illustrators of the Twentieth Century. John Bidwell and Cynthia Owen Philip, Robert Fulton’s Portrait of Lord Stanhope. James Eckman, A Genial Philippic on Taste. Elizabeth M. Harris, Printing and a Museum [the Smithsonian Institution Graphic Arts Division]. Renée I. Weber, Doctoral Research in Printing History, 1970–1984. Warren D. Devine, Jr., The Printing Industry as a Leader in Electrification, 1883–1930. William L. Joyce (reviewer), James P. Bell, ed., John Peter Zenger and Freedom of the Press. J. Dustin Wees (reviewer), Anthony Dyson, Pictures to Print: The Nineteenth-century Engraving Trade. Dennis Stillwell (reviewer), Bruce Beck, ed. Robert Hunter Middleton: The Man and His Letters. Lily Chia-jen Kecskes, Chinese Ink and Inkmaking. Virginia Smith, Longevity and Legibility: Two Types from the De Vinne Press and How They Have Fared. Sibylle Fraser, Underground Printing in Europe, 1933–1945 An Historical Observation. Elliot S. Isaac (reviewer), Gary Marker, Publishing, Printing and the Origins of Intellectual Life in Russia, 1700–1800. Serge Gleboff (reviewer), G. V Bakhareva and S. P. Luppov, Russkie knigi i biblioteki v XVI – pervoî polovine XIX veka: sbornik nauchnykh trudov. Harold Corbin (reviewer), Joseph Blumenthal, Robert Frost and His Printers. Larry E. Sullivan (reviewer), Madeleine B. Stern, Antiquarian Bookselling in the United States: A History from the Origins to the 1940s. Stephen O. Saxe (reviewer), From Punch to Printing Type: The Art and Craft of Hand Punchcutting and Typecasting. Videotape. David Woodward, Maps, Music, and the Printer: Graphic or Typographic? Elizabeth M. Harris, Inventing Printing for the Blind. D. W. Krummel, Clarifying the Musical Page: The Romantic Stichbild. James H. Fraser (reviewer), The Printing History Series of Verlag Renate Raecke. James Green (reviewer), Robert E. Cazden, A Social History of the German Book Trade in America to the Civil War; Christopher L. Dolmetsch, The German Press of the Shenandoah Valley. 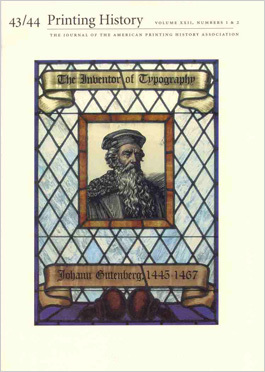 H. George Fletcher (reviewer), Nicolas Barker, Aldus Manutius and the Development of Greek Script & Type in the Fifteenth Century. Szilvia E. Szmuk (reviewer), Anne Anninger, Spanish & Portuguese 16th Century Books in the Department of Printing and Graphic Arts…. John Tebbel (reviewer), Max Hall, Harvard University Press: A History. Roger E. Stoddard, Morphology and the Book from an American Perspective. Benjamin Alterman, Deborah Alterman, and Laura L. Gewissler, From Woodblock to Silicon Chip: The Transmission of Tibetan Language. James Eckman, The Union Type Foundry of Chicago, 1884–1892. James Fraser, Profile: Takashi Kono at Eighty. Hope Mayo (reviewer), William S. Peterson, A Bibliography of the Kelmscott Press. Joseph Blumenthal, Herbert H. Johnson and Carl Schlesinger, In Memoriam: Dr. Robert Lincoln Leslie, Humanitarian and Educator, 1885–1987. 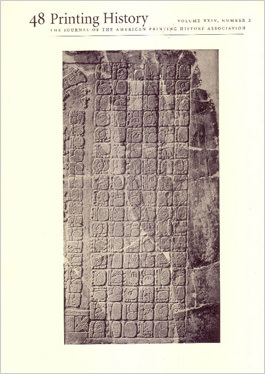 Susan M. Allen, Jane Yetsweirt (1541–? ): Claiming Her Place. Tyrus G. Harmsen, Robinson Jeffers and his Printers. G. Thomas Tanselle, Thoughts on Research in Printing History. Pamela Petro, Gwasg Gregynog: The Reincarnation of a Press. Victor Margolin, Paul Theobald & Company: Publisher With a New Vision. Larry E. Sullivan (reviewer), Sean Wilentz, Chants Democratic: New York City and the Rise of the American Working Class…. John Dreyfus (reviewer), Paul Needham, The Printer & the Pardoner…. Daniel B. Bianchi (reviewer), William J. Glick, William Edwin Rudge. GraceAnne A. DeCandido (reviewer), Alan Crawford, C. R. Ashbee: Architect, Designer Romantic Socialist. Melissa M. Bernhardt (reviewer), Patricia Thomas Sbrebrnik, Alexander Strahan: Victorian Publisher. James N. Green (reviewer), John Tebbel, Between Covers: The Rise and Transformation of Book Publishing in America. Charlotte K. and August E. Brunsman, Wright & Wright, Printers: The “Other” Career of Wilbur and Orville. David Pankow, Dungeons and Dragon’s Blood: The Development of Late 19th and Early 20th Century Platemaking Processes. John A. Lent, Pioneer Women Editors–The Stockdale Sisters of Bermuda. James H. Fraser (reviewer), Colin Franklin, The Ashendene Press. William S. Brockman (reviewer), Donald C. Dickinson, Dictionary of American Book Collectors. William S. Brockman (reviewer), Jeanne Somers, Index to “The Dolphin” and “The Fleuron”. Chandler B. Grannis (reviewer), Matthew J. Bruccoli, The Fortunes of Mitchell Kennerley, Bookman. J. Dustin Wees (reviewer), Gavin Bridson and Geoffrey Wakeman, Printmaking & Picture Printing: A Bibliographical Guide…. Virginia Smith (reviewer), Dale Roylance, European Graphic Arts: The Art of the Book From Gutenberg to Picasso. Clifford A. Harvey, Before Rosebud was a Sled: Documentation and Reprinting of Early 19th Century Commercial Wood Engravings from the GramLee Collection. Gay Walker, Printing for the United States: Meriden Gravure and the U. S. Government. Joseph Dunlap, Emery Walker, Oscar Wilde and May Morris, Emery Walker and “Letterpress Printing”: A Centennial Celebration. Joseph Dunlap (reviewer), Peter Stansky, Redesigning the World; William Morris, the 1880s, and the Arts and Crafts. Philip J. Weimerskirch, Lithographic Stone in America. Irene Tichenor, Theodore De Vinne: Unlikely Leader. Szilvia Szmuk (reviewer). How to Operate a Book. Video. Elizabeth Harris, Press-builders in Philadelphia, 1776–1850. Stephen O. Saxe, Ramage Proof Press. Jennifer B. Lee, “Our Infant Manufactures”: Early Typefounding in Philadelphia. Sidney E. Berger, Innovation and Diversity Among the Green Family of Printers. Susan M. Allen, The Peculiar Defense of Daniel Fowle. Arthur W. Rushmore, When Noah Was A Pup. Stephen O. Saxe, “Franklin” Common Press. Roger Chartier, Histoire de l’édition française. Frederic Brewer, Mr. Artzt’s Western Lever: A Hitherto Unreported Printing Press. Chandler Grannis (reviewer), Bradbury Thompson: The Art of Graphic Design. Marvin J. Taylor (reviewer), John Feather, A Dictionary of Book History. Hugh Amory, ‘Gods Altar Needs Not our Pollishings’: Revisiting the Bay Psalm Book. Margaret Lane Ford, A Widow’s Work: Ann Franklin of Newport, Rhode Island. Corban Goble (reviewer), Carl Schlesinger, ed., The Biography of Ottmar Mergenthaler; A New Edition. Alexander S. Lawson (reviewer), D.J.R. Bruckner, Frederic Goudy. Erich Wronker, A Picture Portfolio of Printing Medals. Jerry Kelly (reviewer), Alexander S. Lawson, Anatomy of a Typeface; Printing Types: An Introduction; The Compositor as Artist, Craftsman, and Tradesman. Herbert H. Johnson (reviewer), A Catalogue of an Exhibition of the Philip Hofer Bequest. Matthew Carter, Theories of Letterform Construction. Part 1. Kay Amert, Origins of the French Old-Style: The Roman and Italic Types of Simon de Colines. Maxwell Whiteman, The Introduction and Spread of Hebrew Type in the United States. Alastair Johnston, ‘Guard the Mysteries! Constantly Reveal Them!’ The History of Printing as Shown in Type Specimens. Mark Argetsinger, Adobe Garamond: A Review Jerry Kelly, Adobe Garamond: A New Adaptation of a Sixteenth-Century Type. 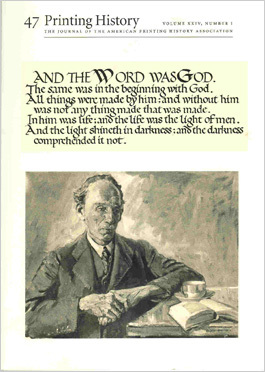 John Bidwell (reviewer), Martin Hutner, The Making of the Book of Common Prayer of 1928. Peter Van Wingen (reviewer), John Dreyfus, A Typographical Masterpiece: An Account of… the Golden Cockerel Press Edition of ‘The Four Gospels’ in 1931. Helena E. Wright, Dard Hunter at the Smithsonian. Walker Rumble, A Time of Giants: Speed Composition in Nineteenth-Century America. Robert Singerman, Naphtali Judah, New York Bookseller and Stationer. Jennifer E. Larson (reviewer), John Carter and Graham Pollard, An Enquiry into the Nature of Certain Nineteenth Century Pamphlets, 2d ed. with new material; Nicholas Barker and John Collins, A Sequel to an Enquiry: The Book Forgeries of H. Buxton Forman and T. J. Wise Re-examined; John Collins, The Two Forgers: A Biography of Harry Buxton Forman & Thomas James Wise. Richard Gabriel Rummonds (reviewer), Stephen O. Saxe, American Iron Hand Presses. Sandra J. Markham, Memento Mori on Silk and Stone: Reuben Manley, Printer, 1818–42. David A. Hanson, Baron Frederick Wilhelm von Egloffstein: Inventor of the First Commercial Halftone Process in America. Stephen O. Saxe, The Landis Valley Museum Ramage Press. Alastair Johnston, Reflections on the Centenary of the Merrymount Press. Megan L. Benton, C. Volmer Nordlunde: The “Grand Old Man” of Modern Danish Printing. Lowell Bodger (reviewer), George Sadek and Maxim Zhukov,Typography: Polyglot. A Comparative Study in Multilingual Typesetting. Sidney E. Berger (reviewer), William Blades, Numismata Typographica; or the Medallic History of Printing. John Dreyfus (reviewer), John Rathé, Bibliography of the Typophile Chap Books, 1935–1992. H. George Fletcher, The Ideal of the Humanist Scholar-Printer: Aldus in Venice. Paul A. Cyr, Joel Munsell, Aldus’s Disciple in Albany. Martin W. Hutner, Daniel Berkeley Updike: Humanist, Scholar, Printer. Elizabeth Harris, The Rail Presses. Walter Tracy, Why Egyptian? Lawrence W. Wallis, Type Designs by George W. Jones for the Linotype Machine. Patricia A. Cost, Linn Boyd Benton, Morris Fuller Benton, and Typemaking at ATF. Dermot McGuinne, Victor Hammer-An Irish Connection. Mike Parker, W. Starling Burgess, Type Designer? Dan Carr (reviewer), Theo Rehak, Practical Typecasting. Terry Belanger, Twenty Years After. Michael Winship, The Art Preservative: From the History of the Book Back to Printing History. Marcus A. McCorison, John Mycall-The Ingenious Typographer of Newburyport. W. Thomas Taylor, The Temper of the Present. Barbara Henry (reviewer), Maurice Annenberg, Type Foundries of America and Their Catalogs, (with additions and an introduction by Stephen O. Saxe). 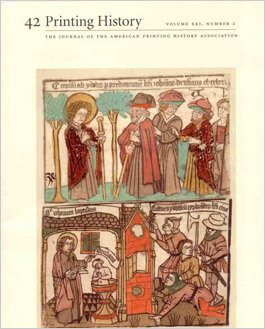 Kathleen A. Walkup (reviewer), Roger Levenson, Women in Printing. Northern California, 1857–1890. Steven Leuthold, The Book and the Peasant: Visual Representation and Social Change in German Woodcuts, 1521–1525. Joseph A. Dane, The Curse of the Mummy Paper. James N. Green, ‘The Cowl knows best what will suit in Virginia’: Parson Weems on Southern Readers. Jane R. Pomeroy, On the Changes Made in Wood Engravings in the Stereotyping Process. An Index to Printing History, Issues 1–32. Paul F. Gehl, The Europeans Are Coming! Or, What’s New in Continental History of the Book: A Review Essay. Walker Rumble, Strategies of Shopfloor Inclusion: The Gender Politics of Augusta Lewis and Women’s Typographical Union No. 1, 1868–1872. Corban Goble, Rogers’s Typograph Versus Mergenthaler’s Linotype: The Push and Shove 0f Patents and Priority in the 1890s. Jerry Kelly (reviewer), John Dreyfus, Into Print; Selected Writings on Printing History, Typography and Book Production. Corban Goble, Mark Twain’s Nemesis: The Paige Compositor. Robert D. Harlan, Origins of San Francisco Fine Printing Traditions. Michael Peich, William Everson: Fine Printer. 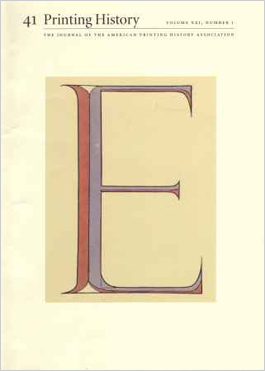 Harold Berliner, Nicolas Barker, Jim Rimmer, & John Dreyfus, Starling Burgess, No Type Designer: A Rebuttal of Some Allegations and Suppositions Made by Mike Parker in his Article “Starling Burgess, Type Designer?” in Printing History 31/32 (1994). David Pankow, A Face by Any Other Name is Still My Face: A Tale of Type Piracy. G. Thomas Tanselle (reviewer), William Tomlinson and Richard Masters, Bookcloth 1823–1980. 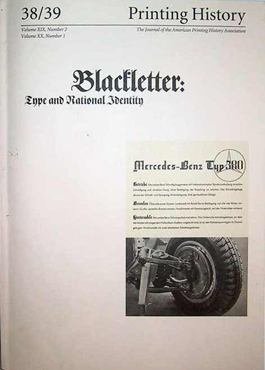 Peter Bain and Paul Shaw, Blackletter: Type and National Identity, A Catalog of the Exhibition, March 3 to May 2, 1998. Marvin J. Heller, Mirror-image Monograms as Printers’ Devices on Title Pages of Hebrew Books Printed in the Seventeenth and Eighteenth Centuries. Richard M. Candee, Illustrating Invention: Nineteenth-century Machine Advertising for the Aikens of Franklin, New Hampshire. Peter E. Hanff, Way & Williams, Publishers, Chicago, 1895–98. Alfred W. Baxter, Grabhorn Press Ephemera: The Missing Matter. Kenneth Auchincloss, The Second Revival; Fine Printing Since World War II. Martino Mardersteig, The Cento Amici del Libro. Carol Grossman, The Trianon Press’s William Blake’s Water-colour Designs for the Poems of Thomas Gray. Sebastian Carter, The Rampant Lions Press-Retrospectus and Prospectus. Joseph A. Dane, The Huntington Apocalypse Blockbook (Schreiber Editions IV/V) with a Note on Terminology. Kay Amert, A Renaissance Font: Paris, 1516. Peter K. Fallon, Why the Irish Speak English: The Consequences of One Culture’s Resistance to Technological Change. Philip J. Weimerskirch, The Rev. Abraham O. Stansbury and the Stansbury Press. Gerald Lange, Fraternal Offspring: Matthew Carter’s Manutius/Miller. David Pankow, Editor’s Introduction: The Rise and Fall of ATF. Jennifer B. Lee, Introduction to the Exhibition. Type to Print: The Book & The Type Specimen Book. Jennifer B. Lee, editor, The Bullen Letters. Donald C. O’Brien, The Early Nineteenth-Century Boston Engraving Trade and the Engravers who Developed it. Robert Bringhurt, The Voice in the Mirror. Kay Amert, Digital Comparison of Letterforms. Frank Romano, The Phototypesetting Era. Peter Holliday, Edward Johnston & Robert Bridges, 1901–1926: A Phonetic Alphabet in the Half Uncial Script. Robert D. Harlan, Seven Letters from C. H. St. John Hornby to John Henry Nash. Jerry Kelly (reviewer), Marianne Tidcombe, The Doves Press.